Today Apple also updated the iMac. These models are at a lower price than the previous release and available now from the Apple Online Store. The new iMac line includes a Core 2 Duo processor starting at 2.66GHz with 6MB shared L2 cache, Nvidea GeForece 9400M graphics, four USB 2.0 ports, a FireWire 800 port, a Mini DisplayPort, built-in AirPort Extreme 802.11n wireless networking, Gigabit Ethernet, Bluetooth 2.1+EDR, built-in iSight camera and microphone, stereo speakers, glossy LCD display, an 8x SuperDrive, keyboard and a Mighty Mouse. The 20-inch iMac ships with a 2.66GHz processor, 2GB RAM with support for up to 8GB, and a 320GB 7200RPM SATA hard drive for US$1,199. The 2.66GHz 24-inch model includes 4GB of RAM and a 640GB 7200RPM SATA hard drive for $1,499. The 2.93GHz iMac ships with 4GB RAM, Nvidea GeForce GT 120 graphics with 256MB memory, and a 640GB 7200RPM SATA hard drive for $1,799. The 3.06GHz 24-inch iMac sports 4GB RAM, Nvidia GeForce GT 130 graphics with 512MB memory, and a 1TB 7200RPM SATA hard drive for $2,199. 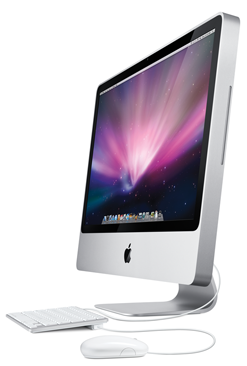 You can read more about the iMac’s technical specifications, features, design and environmental status report.